7.04%AA East Kent Goldings hop for use in home brewed all grain beers - Vacuum packed for longer shelf life. 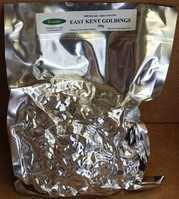 East Kent Goldings Variety is a standard Goldings hop which is a gentle fragrant hop used mainly in Ales, Bitters and ESB. It can be used for bittering as well as aroma/dry hopping. If unavailable, it can be substitued with Styrian Goldings, Fuggle or Willamette. Its typical alpha acid levels are 4.0-6.0% depending on the harvest, so you may need to adjust the amounts used in your recipe to ensure that you match the target EBU value.